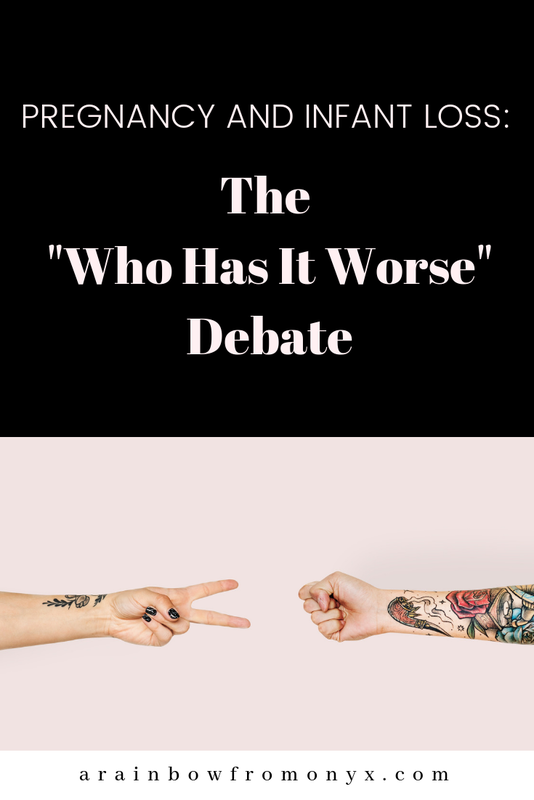 There's a phenomena in the loss community that I refer to as The "Who Has It Worse" Debate. 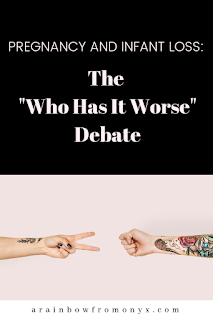 I got sucked into this debate myself after my first loss. 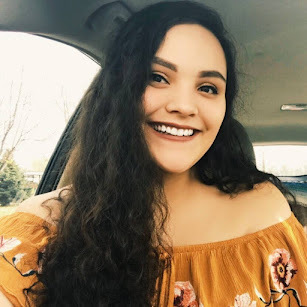 It all started when I joined my first miscarriage support group on Facebook and I found myself overwhelmed with the fact that there are so many people who miscarry in their second trimester. 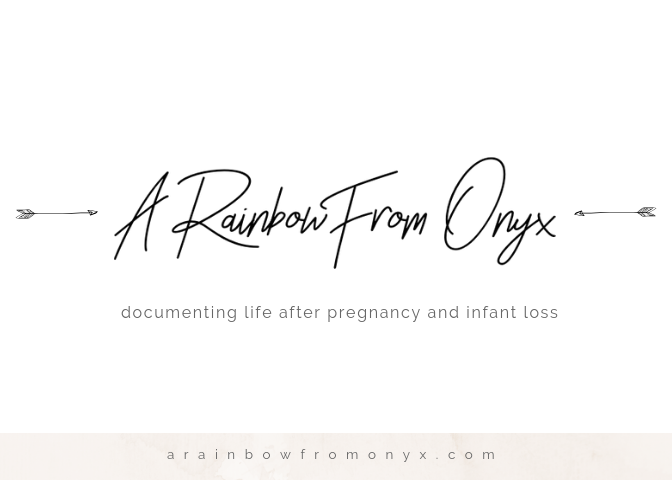 Both of my miscarriages happened in the first trimester and I felt really guilty that I was falling into a depression from an "early loss" while there were parents who lost their babies further along. I found myself commenting things like "I had a miscarriage too BUT it was in the first trimester". Whenever I'd post about my experience other people would comment things like "I had a loss too BUT it was much earlier, I can't imagine what it's like for you." After my second loss I found myself doing the same thing when I came across stories of those who lost their babies to SIDS. I remember thinking "oh my gosh, I can't imagine losing a BABY BABY". I started questioning whether or not I even "deserved" to grieve. Then when I was diagnosed with secondary infertility it happened again. I came across a story about someone who has tried for more than a decade to get pregnant and I felt so guilty. I told myself to be grateful because "at least you've gotten pregnant twice before". I didn't realize that I was diminishing my own experience and the experiences of many others. Looking back, I think I felt like this because it was my way of trying to not feel the pain that I had from having two miscarriages. I kept telling myself that other people have it worse as a way to force myself to "move on" from my own experiences with loss. I thought the quicker I can move on, the better but that ultimately resulted in me having really unhealthy coping mechanisms. It wasn't until I had my third loss - our son Onyx - that I realized no one "has it worse". Whether you're 5 weeks, 40 weeks or your baby passes away after their first birthday, a loss is a loss. There are some differences in terms of the memories and experiences that we have but we are all grieving the loss of our babies. We are all grieving the loss of hopes and dreams. Your loss matters. Your baby matters whether you were 10 weeks pregnant or they were 10 months old. Your experience is valid. Be gentle with yourself.